Geo-Solutions was contracted by the State of Wyoming to install the seepage cutoff wall along the length of the impoundment dam. 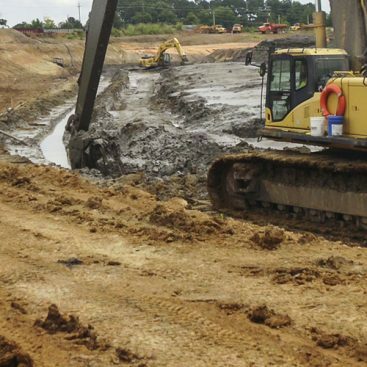 The Impoundment Structure Core project is designed to cut off seepage and allow the raising of the reservoir level. The reservoir is stocked with fish and is open to the public for fishing access. The Engineer designed the project using in-situ mixing instead of a conventional slurry trenched cutoff wall due to concerns about stability of the tailings dam and the close proximity of the reservoir. 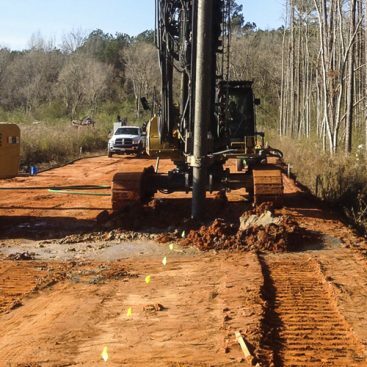 The seepage cutoff wall includes the installation of 43,000 vertical square feet (vsf) of Deep Soil Mixed wall. The wall was installed to a maximum depth of 60 feet below ground surface, and is keyed into the underlying low permeability bedrock. The soil mixing was completed through zones of sandy and clayey spoils (tailings), alluvial clay, and weathered sandstone. The cutoff wall was terminated in competent sandstone. All elements of the DSM wall were advanced to drilling refusal. The DSM cutoff wall soil mixing was performed using Geo-Solutions’ 4-auger Deep Soil Mixing rig. 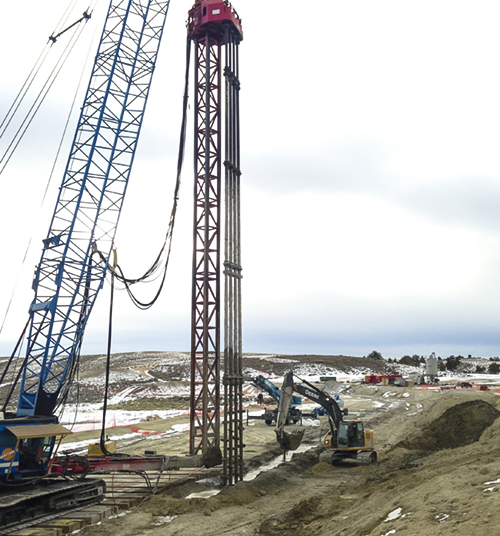 This rig is mounted on a Manitowoc 4100W Series II crawler crane. 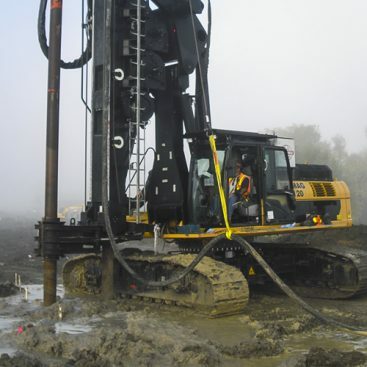 The rig is fitted with 4 overlapping, 3-foot diameter augers designed to install a continuous wall with a minimum width of two feet. The hollow stem augers are rotated and advanced through though the soil as grout is pumped through them. In this manner, the soil is mechanically cut and blended, to ensure a homogenous mix throughout the DSM. The cement-bentonite grout is created at GSI’s on-site batch plant. The bentonite-water slurry is first created using a jet-shear mixer. The slurry is then blended with Portland cement in a high-speed colloidal mixer using a bulk silo. The cement-bentonite grout will be thoroughly blended until a homogeneous mix is achieved. The mixed cement-bentonite grout is then transferred to a holding tank within the plant until it is pumped to the DSM rig. 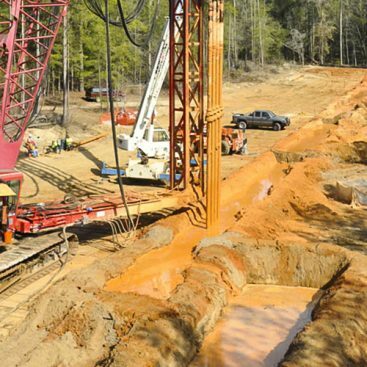 The blending of both cement and bentonite into the soils was designed to lower the permeability and increase the shear strength of the soil in the core of the impoundment structure. Prior to the start of the project, a laboratory mix design program was conducted to determine the reagent addition rates to achieve the project goals of 1×10-6 cm/sec permeability and 100 psi UCS. Numerous soil types were modeled in the laboratory to characterize two distinct areas of the site. The installed cutoff wall included 15-18% Portland cement and 1-2% bentonite by weight of soil. The primary challenge on the project site was the presence of large cobbles and boulders throughout the tailings layers. These obstructions initially prevented the soil mixing augers from reaching the target depths. Geo-Solutions rerouted the alignment in some areas to place the wall around the larger boulders. 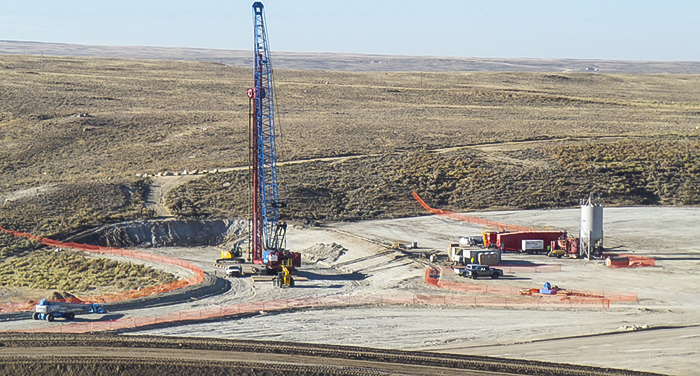 As the project progressed, it was determined that the boulder layer was continuous throughout the tailings layer and could not be avoided by re-routing the alignment. To mitigate this, Geo-Solutions mobilized a long reach excavator attachment that was mounted on a PC490 excavator. This was used to remove obstructions (cobbles and boulders) within the cutoff wall alignment. The process involved mixing a given element of the DSM wall until an obstruction was reached. The long-reach excavator operator would then push the excavator stick through the wet soil-mix material to reach and remove the obstructions. In this manner, the obstructions could be removed without a large, open excavation. The other challenge was that this project was completed in a very remote area of Wyoming. Geo-Solutions kept additional equipment and spare parts at the site to mitigate this situation.